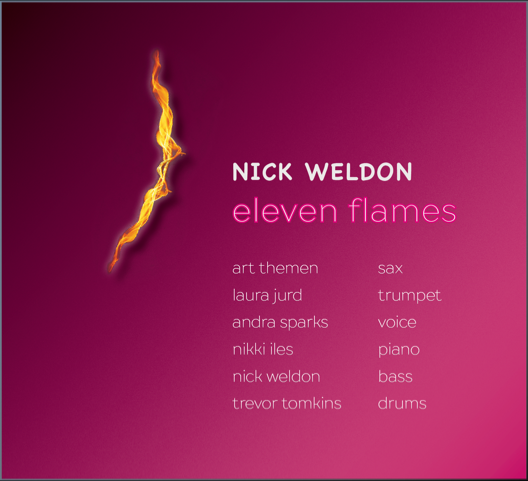 It is quite a few years since I heard Nick Weldon's fluent, percussive, classically bop-influenced piano on those two excellent Steve Waterman CDs based on the arrangements and compositions of Gil Evans, Wayne Shorter, Herbie Hancock and Benny Golson. Since then, near silence, with few dates as in-demand piano player on the live small club circuit. Two things have happened since. One, he has re-defined himself as a very fine bass player, and, two, he moved out to Northants to establish a very successful jazz school, with the assistance and collective endeavour of the singer on this album, Andra Sparks. Clearly, a thoughtful man. I imagine that this brilliant album has been brewing for some time. First, the musicians have been carefully chosen for they run across several fault lines, representing different generations and there is an equal balance of the sexes. Second, there is a wide range of musical influences here. Weldon is not afraid to present material as wide as a setting of a poem by John Dryden, a trivial-sounding piece of Swing floss, It's Crazy, as well as demonstrating the notion of black resistance at the heart of jazz and blues in Monk's reworking of an old standard into his original, Evidence. On the surface this is a five-piece band, with a singer, Andra Sparks, who is required to perform across a wide range of material, which she does beautifully, without for one moment sounding as if she is doing impressions: everything has genuine integrity and if you listen a few times to the album you can almost sense the spark of collective endeavour rather than singer and accompaniment. On the opening track, Where You Are, Weldon's lyric to a Metheny composition Question and Answer, she sounds almost Tobinesque, with a strong, folk-like quality, in complete contrast to the next one, Jimmy Rowles and Johnny Mercer's Baby Don't You Quit Now, where there is more than a soupcon of sensuality, livened up by wit. On I Feed a Flame Within, the adaptation of John Dryden's poem Hidden Flame, Weldon takes a setting by viola player Madeline Dring, a student of Ralph Vaughan Williams, as his starting point, and here there is the mildest touch of a sprechstimme quality, that strange mix of speech and song that filtered its way from late 19th-century German opera into much of Kurt Weill. No doubt about it, Andra Sparks is a quite remarkable singer. As indeed are the instrumentalists in this truly satisfying group. Lovely to see a New Generation player like Laura Jurd standing shoulder to shoulder with one of the true greats of the British scene Art Themen, along with Nikki Iles, who on some of the material seems to have looked back a little to an earlier period, as on It's Crazy, a tune that King Cole enjoyed playing, with classic comping behind Themen's story-telling before his inner free-improv man threatens to break out on his final choruses. Drummer Trevor Tomkins and the whole section are splendid on this one and while I put down the song as 'floss' this his how terrific players turn floss into gold. Laura Jurd is from a whole different background, and her calm lyrical voice alongside Iles on Weldon's exquisite One Kiss, a memorable melody line with just a whiff of Sondheim, shows one of her many qualities that won that Worshipful Company of Musicians award a few years ago. Not that she hasn't got bebop chops as well and by the time we get to the final track Hushabye Island (ignore the slightly Listen With Mother vibe of the original song) she is in marvellous, upbeat form – "roarin'", as John Surman might say. To close, two Monk tunes are outstanding. Weldon writes about how Evidence, based on Just You Just Me, was originally to be called Just Us; from there it is a short step to Weldon's Justice Song, the lyric of which, is chanted, none too clearly, by the band at the beginning of the track. Fortunately, the words of the poem Drums and Whispers are printed inside the cover. Everyone swings like mad on this one and the way Sparks flies with the words of Just You Just Me over the punchy rhythm pattern of the Evidence melody line is truly exhilarating. The other Monk tune, Ask Me Now, with a bittersweet lyric by the groovemeister of the 20th century, Jon Hendricks, is just gorgeous. Andra Sparks' reading of the lyric and Art Themen's opening statement of the melody, redolent of long past and mostly forgotten masters like Lucky Thompson and Don Byas, to me are the perfect illustration of what a jazz ballad should sound like. Put this album in your car system and, if you are like me, you will be discovering fresh musical delights for at least two weeks. Yes it's a wonderful album. Themen's solo on the first track is astonishing. So much to admire.